Subscribe to our Newsletter for exclusive specials & offers! Chief goose and mother of three, Heidi, loves kids and loves creating her unique designs especially for them! Although the range has now expanded to produce artwork for all areas of the home...groovy goose first started with kids in mind! 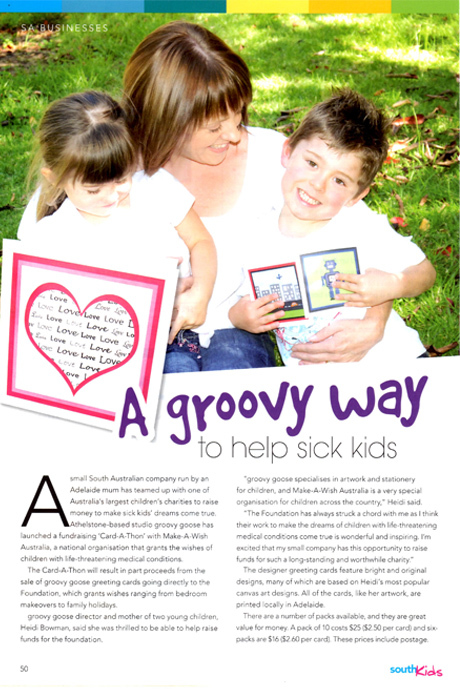 So in June 2011, when it came time to release our new range of Australian designed and printed designer linen textured greeting cards, we wanted to use the occasion to join forces with a children's charity to raise money and raise awareness of the work they do. Choosing a charity was hard work...there are so many worthy children's charities in Australia supporting the needs of children and their families. After a long deliberation groovy goose chose to raise money for the very worthy Make-A-Wish Australia. Make-A-Wish Australia grants the wishes of a child with a terminal illness. Make-A-Wish Australia have a large number of branches throughout Australia and many hard working volunteers who help to raise money for the charity and help to organise these wishes for the children and their families. The wishes granted from these brave and inspiring children range from meeting their heroes to bedroom make over’s. It brings them something to look forward to and fantastic and lasting memories for them and their families. 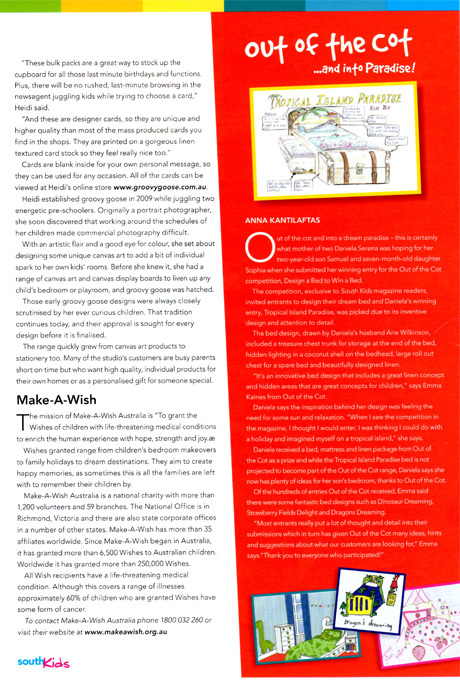 While promoting our card-a-thon to raise money for Make-A-Wish we were supported by South Australian kids magazine, South Kids to help us spread the word and raise awareness of our fundraiser. The article can be seen below. groovy goose would like to thank South kids for helping us to promote our fundraising for Make-A-Wish Australia.